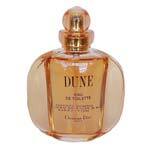 Christian Dior introduced Dune in 1992. This fine fragrance contains lily, wallflower, peony and is accented with amber, musk and vanilla . Dune is recommended for evening use.